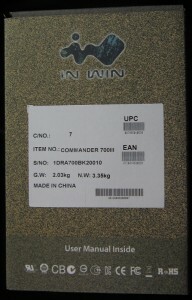 We’ve got a new unit from In Win here, the latest in their “Commander” series (now on it’s third iteration). This unit’s sub-species is the Desert Fox. 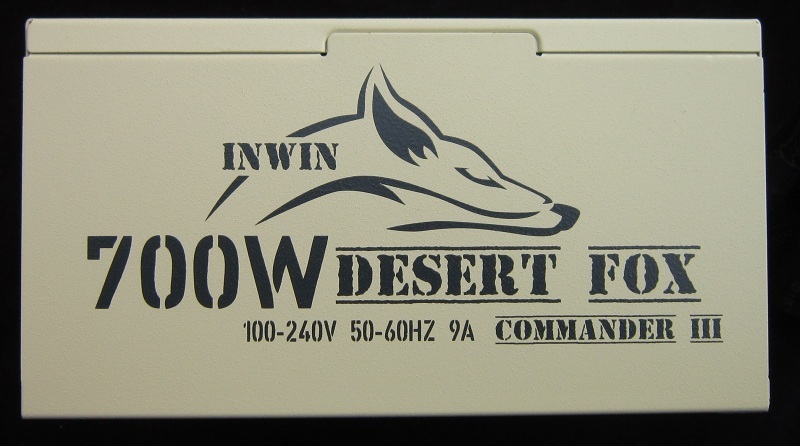 It’s an interesting name choice to me, as “The Desert Fox” was Erwin Rommel’s nickname in WW2. He was definitely one hell of a commander, but being a Nazi not many companies name things after him. I’m assuming that the naming of this PSU is aimed more at capturing the idea of amazing performance in bad conditions than the PSU’s political beliefs. 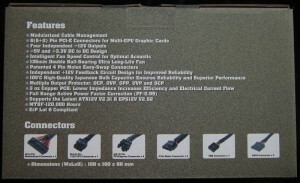 I’m not sure how to test a PSU’s beliefs so I’ll focus on performance regardless. The previous Desert Fox faced the fairly famous “Victory or Death” orders, that’s pretty much what I demand of PSUs too. Which will it be? In Win’s product page has a distinct shortage of text to copy/paste, so here are a bunch of screenshots. 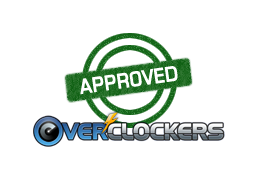 They’re quicker, easier and clearer than box photos generally are, so I call it efficiency! Definitely not laziness in not wanting to type it all up. Quite the OverPowerProtection range! The active PFC is a given with (real) 80+ units, it’s impossible get to an 80+ badge without it. Similarly the efficiency numbers are the minimum allowed by 80+ Gold. The 0 °C to 50 °C operating temperature sounds good to me, 50 °C is nice and toasty. Not sure I’ll be able to get TEUW that hot. 135mm fans are pretty standard, largely because one PSU manufacturer managed to patent the idea of having a 140mm fan in a PSU. What the hell, Patent Office? 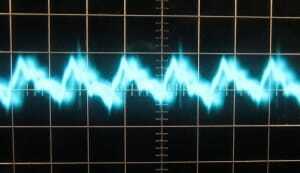 MTBF of 120,000 hours is high, as always I question the reality of the MTBF people when faced with a single unit. Third Generation Army Desert Design! But which Army might that be? The color scheme is… different. 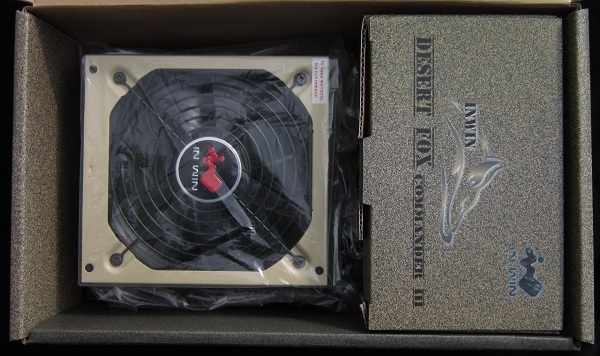 It does match Noctua fans roughly speaking, which is a first. 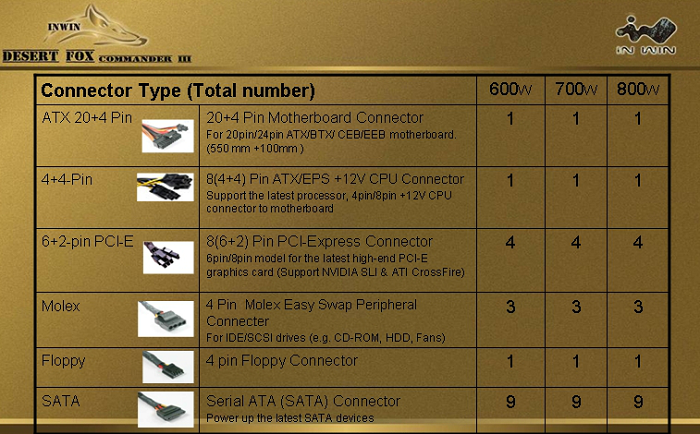 I’d certainly hope a 700 W PSU supports CFX/SLI. I’d be depressed if it didn’t. Modular! No labels, but it should be pretty obvious what goes where. DC-DC is great. 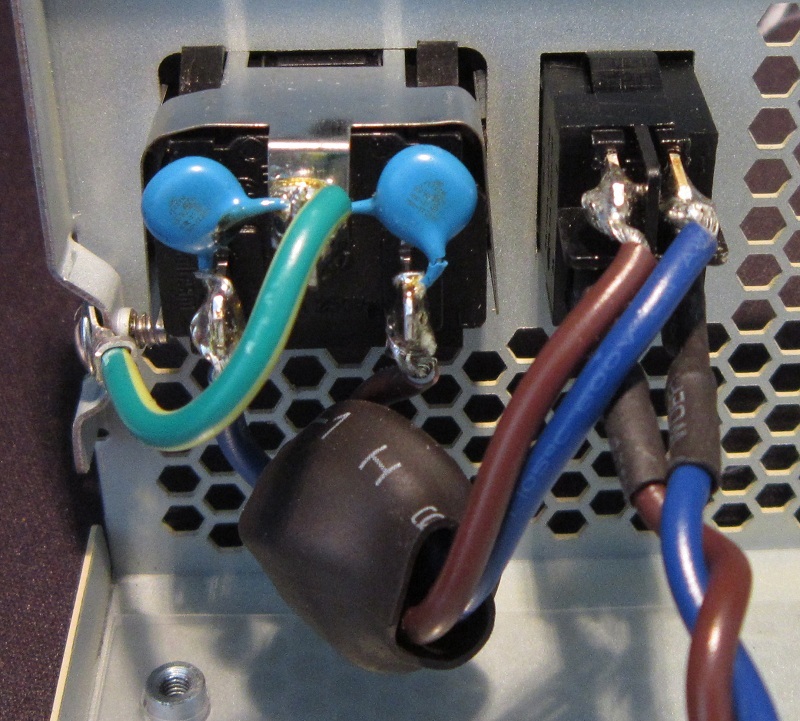 Along with efficiency it also generally means the PSU can put out close to its full load rating in 12 V alone. 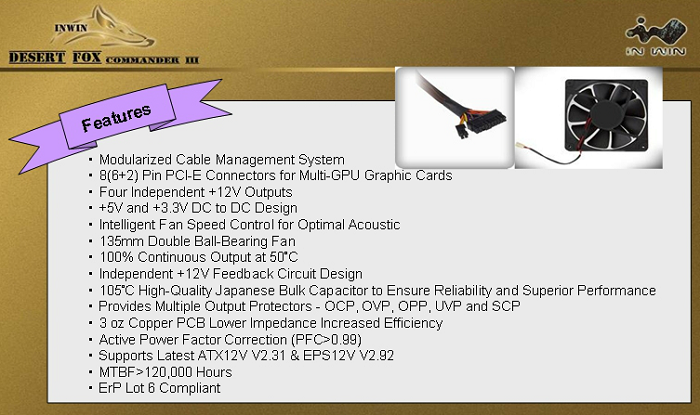 Very useful, given that most modern computers use almost entirely 12 V. That fan looks rather beastly. In Win gets some points for honesty here (assuming the APFC caps really are Japanese). They’re very specific about which caps are Japanese, unlike many brands that just advertise “Japanese Capacitor(s)!” and leave out that it’s only the APFC cap. 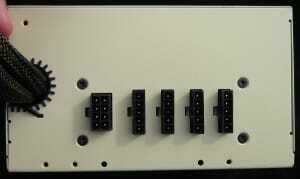 Four 12 V rails is nice, too. 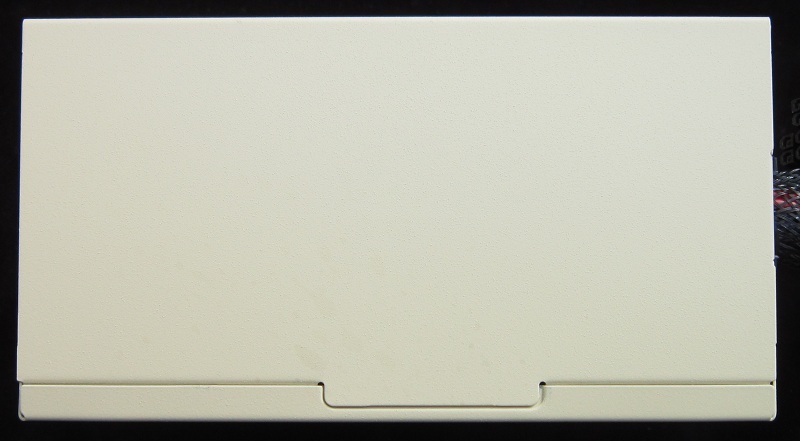 The platform looks vaguely familiar, but doesn’t ring any bells as to a specific manufacturer. We’ll look in more detail in the Dissection Section. 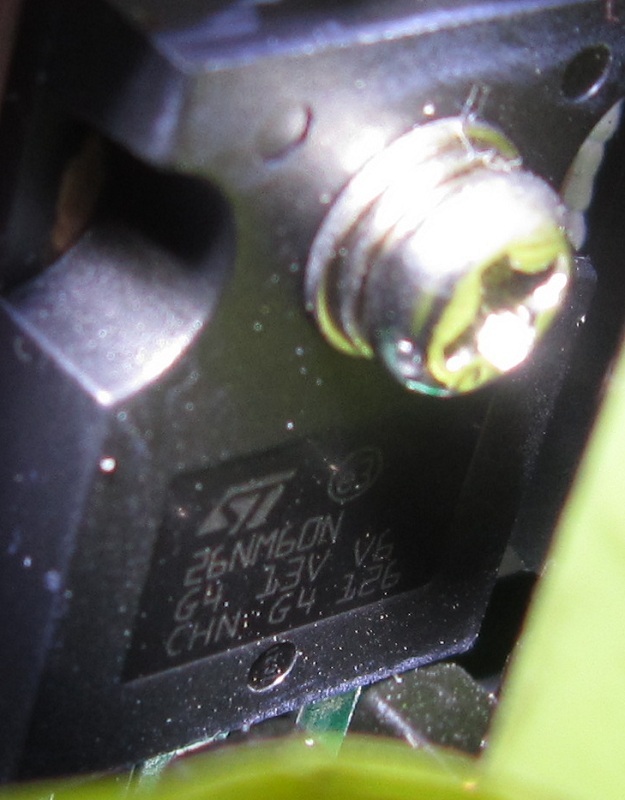 This is the 700 W unit, not that it appears to matter in the slightest connector wise. Seems a bit short on Molex plugs to me. Mostly covering old ground here, but it does sum up the previous six pictures nicely. 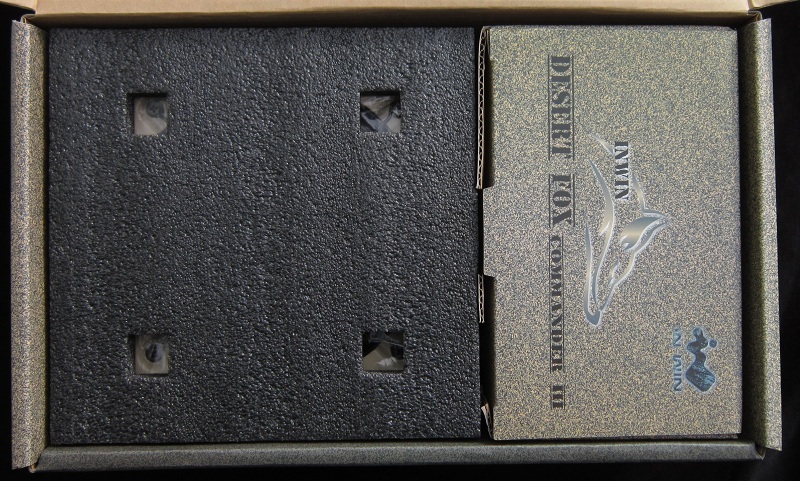 On The Front of The Box, I See A Fox! 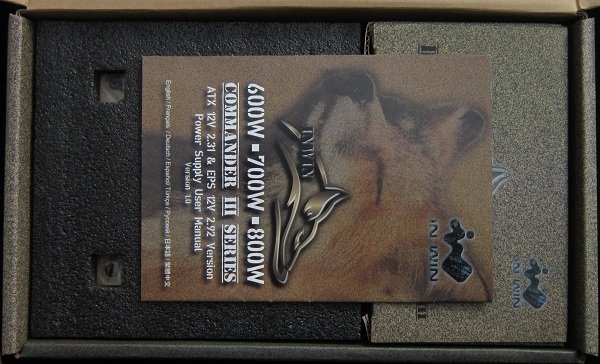 The box is militarily themed with a digital camouflage pattern, rather finer grained than the military actually uses, but similar otherwise. 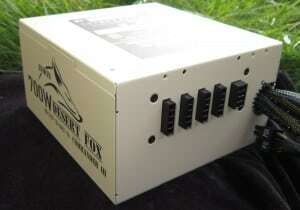 It has some foxes on it as well as plenty of information. 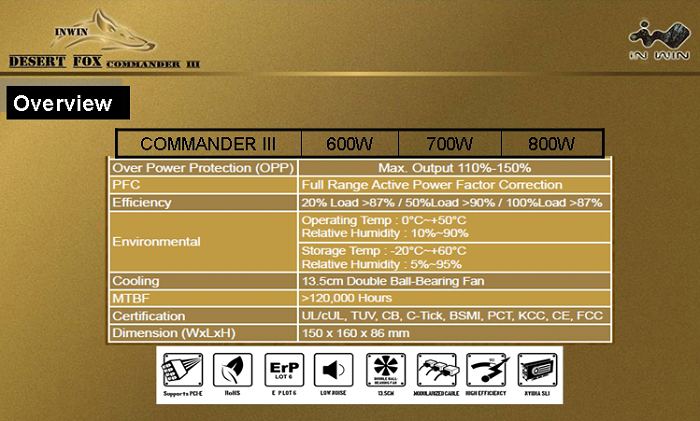 I was going to discount the whole In Win Commander / Rommel connection until I realized that the bullet point markers are all Iron Crosses. Now I wonder if someone inside In Win did this as a subtle troll job, or whether it’s intentional on a wider scale. As a historical side note, Rommel was actually a relatively honorable character who refused direct orders to kill Jewish prisoners and captured commandos, his POWs were treated well too. He met his end due to being part of a plan to arrest Hitler and take him to trial (not, mind you, assassinate. Honor works both ways), or more specifically due to the plan being found out. Thus ends the history side note. 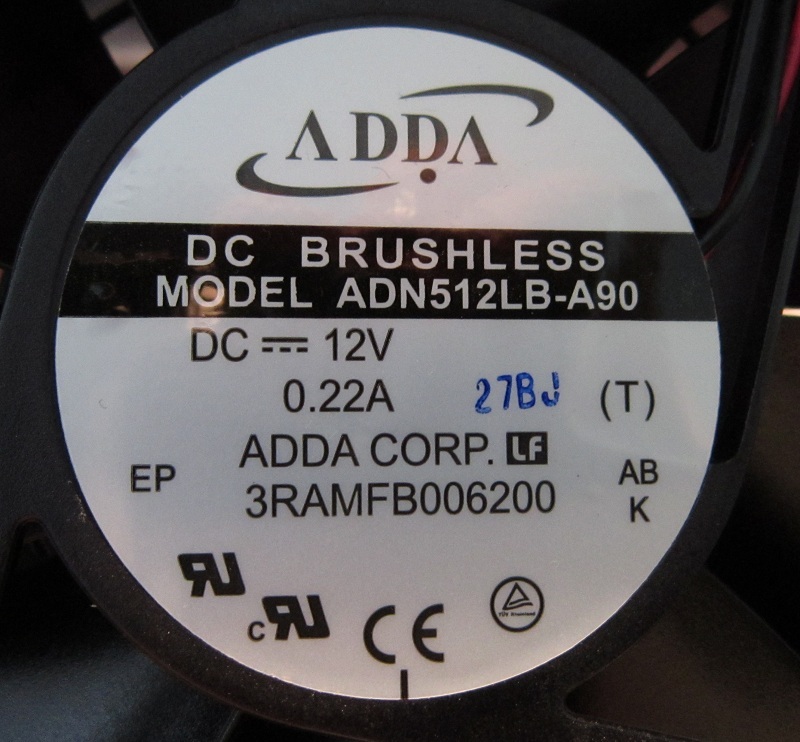 Not a bad guy to name a Commander series PSU after in my opinion. OK I lied. not quite the end. The Iron Cross was the emblem of the Prussian military before Germany existed as such, and of Germany until 1918. After that it was relegated to just being a medal. The box proves to be very versatile, not only does it keep things inside it and have a handle for carrying it, you can even open it! The Manual Comes Out Too! 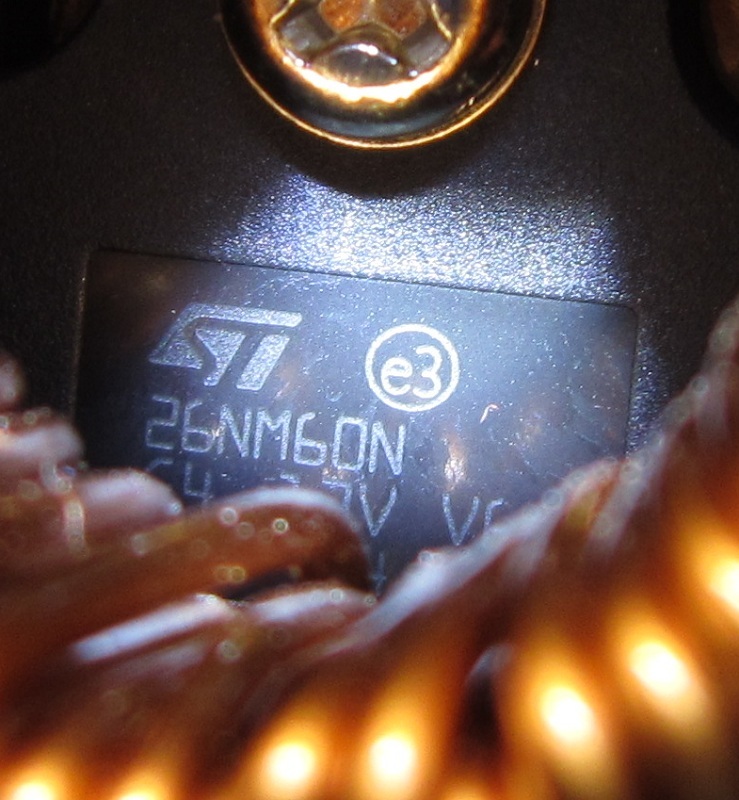 Finally We Found The PSU! Now that we’ve found the PSU, we’ll move onward to the next section and look at it. No socks on this fox, just a crackle-tan (Tan Drab?) paint job and some painted on logos and such. No stickers here! 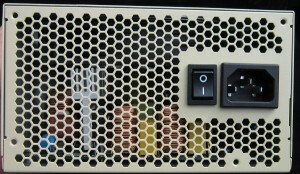 I like the lack of stickers, especially the lack of stickers that cover the modular PCB screws. It makes my job easier. We’ll do some straight on shots for more detail too. It’s kind of an odd unit, you don’t see many non-standard paint jobs these days. Fewer still are non-standard paint jobs that aren’t lurid stripes and LED filled windows. It wouldn’t fit in especially well in my case, but I like it’s simplicity of styling. It appeals to me. 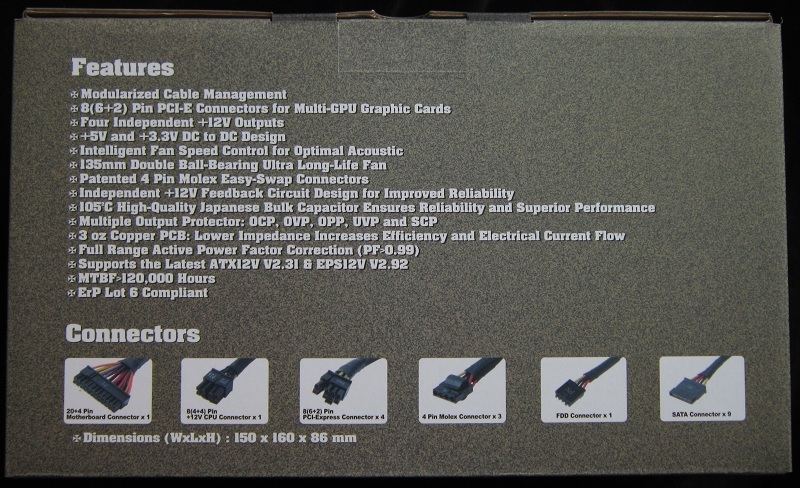 It’d be perfect for someone who wants to do a camo/military themed build but doesn’t want to take their PSU apart (don’t take PSUs apart). The modular connectors are unlabeled, but also impossible to plug in incorrectly without pushing really really hard and leaving a leg hanging off the end of the PCIe connector. If you do that, things will die. The hardwired cable selection has the ATX24P motherboard connector, the 4+4P CPU power connector, and one cable with two 6+2P PCIe connectors. The sleeving on the ATX24P cable is rather short, but on the plus side the +4 part slides on rather than making you hold it. The sleeving on the rest of the cables is quite good. 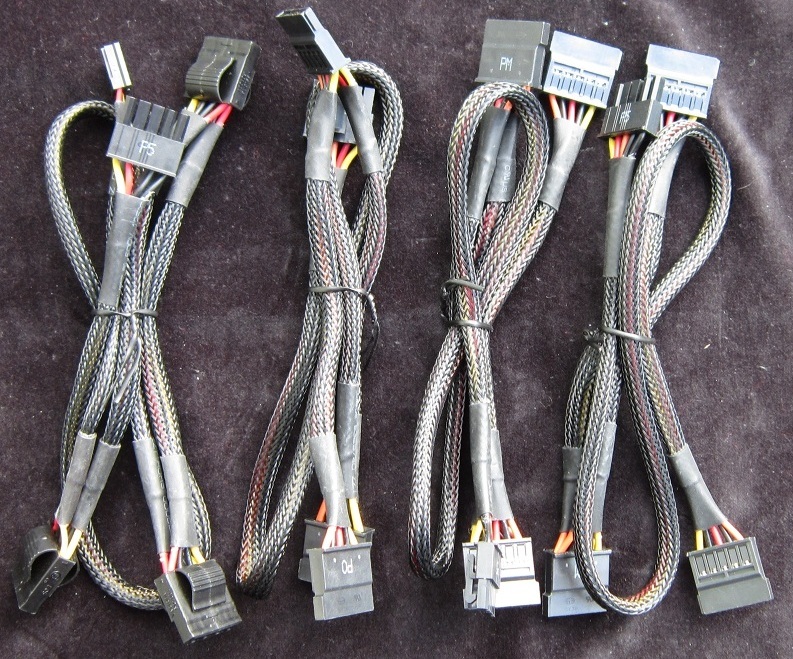 We get one Molex cable with three Molex plugs and one FDD power plug, plus three SATA cables each with three plugs. 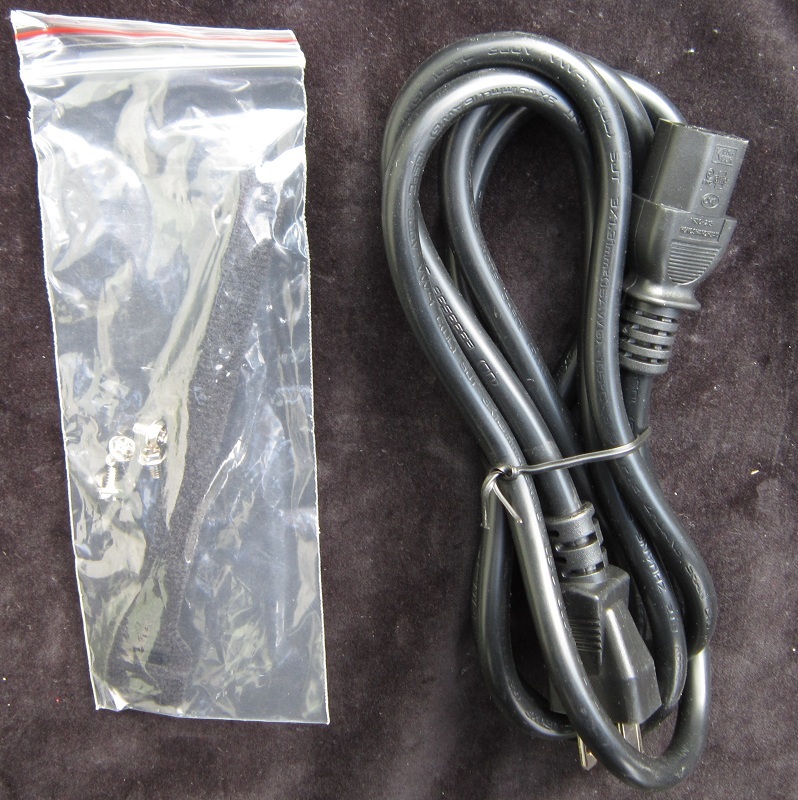 The power cord is significantly thicker than the minimum required for 700 W, I’m very happy to see this. I am also very happy to see hook+loop cable ties in the bag, rather than the use-once-then-cut-them-to-remove sorts. You get some silver, flat bottomed, screws too. Victory or death time! 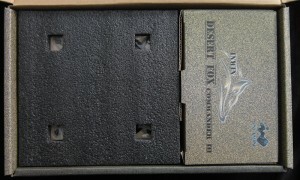 Let’s see how the Desert Fox does. Quite well is the answer to that one. 12 V regulation was 1.4%, very good, though short of the 1% OMGOMGOMG mark. 5 V regulation was 0.78%, well below the previously mentioned 1% mark. 3.3 V is a bit less glorious at 3.3% due to a strangely high zero load reading. With any load at all it drops down into the expected 3.3x range (which would have given it 0.6%, had it done 3.34 V at zero load). Unfortunately for the unit, I score on the full range. The averaged result is 1.8%, very good when you get down to it. The kill-a-watt speaks of excellent efficiency, for whatever that might be worth. 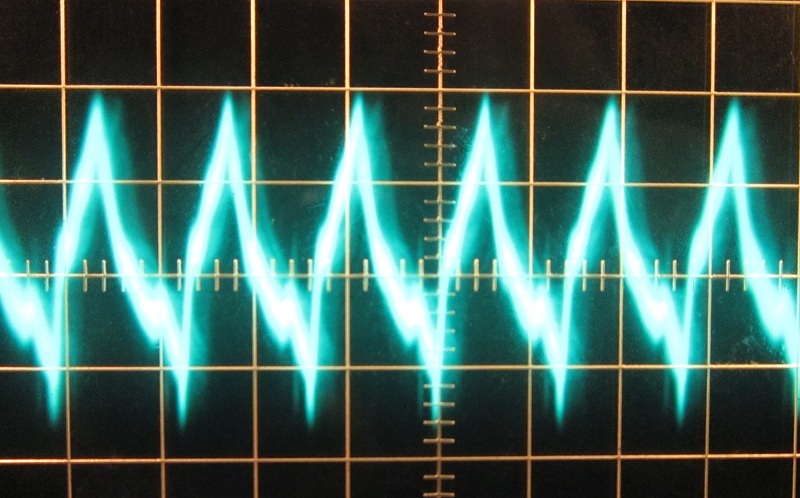 How much it’s worth depends on how much you trust a Kill-A-Watt with an APFC load. Temperature and fan wise, until I put the unit into TEUW I heard very little out of the fan. It was content to whisper along with a very slight, whispery, bearing noise. Once the intake air exceeded 20 °C (at full load, mind you) the fan started to speed up. 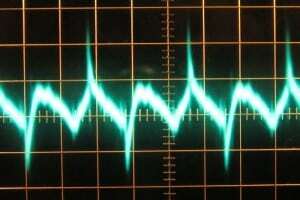 Primarily I heard airflow noise, but under the airflow noise was a motor sounds that sounded for all the world like a well muffled car engine. Odd. Nothing especially offensive though. The unit did 50 °C without issue. The 4 °C delta between intake and exhaust is oddly low, but those are the numbers I got and therefor those are the numbers you get. The fan does move a lot of air at full blast, so that’s part of it. 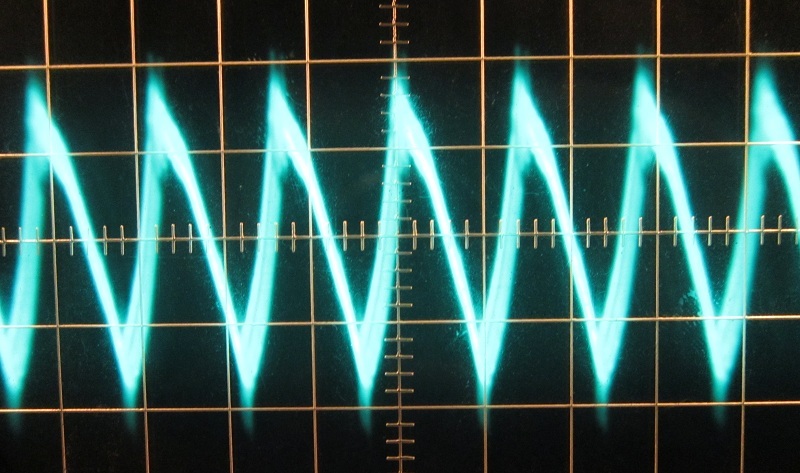 For the first set of shots the 12 V rail shot is at 5 ms/div and 10 mV/div while the 5 V and 3.3 V are at 5 µs/div and 10 mV/div. Excellent on 12 V, decent on 5 V, excellent on 3.3 V. The real test is at full load of course, but some units really don’t appreciate super low loads. 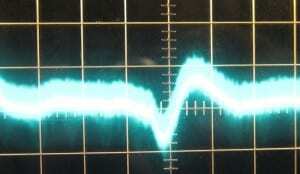 I feel that testing here is important with the new ultra low power states for CPUs and GPUs. Next up we have the full load 48-50 °C ambient tests, they’re essentially identical to the full load cold ambient tests so showing both would be excessive. 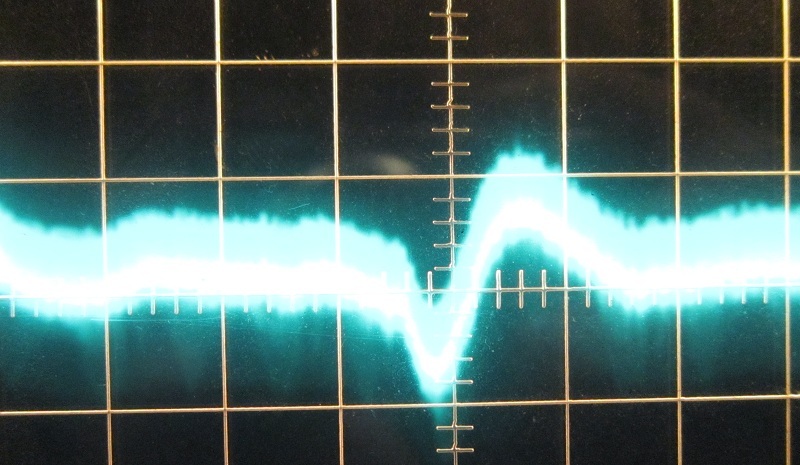 For the 12 V shot the scope is at 10 µs / 20 mV, while 5 V and 3.3 V are at 5 µs / 10 mV. Not quite so clean here, but still a pass on all fronts. 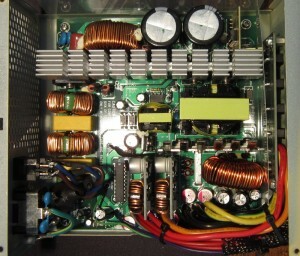 The 12 V rail hit 89 mV, the cap is 120 mV. Still lots of room, but I want to see something in the 30 mV range or lower in a perfect world. 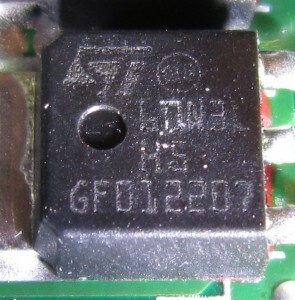 The 5 V and 3.3 V are in the low 40 mV range, the cap is 50 mV. I’d like to see <25 mV in a perfect world. Regardless of what I want to see, all rails are solidly under the specification, so this is a pass! This fan moves a lot of air for 0.22 amps, I’m impressed. 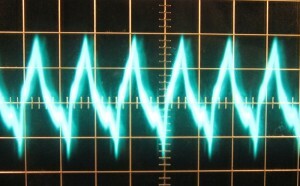 Not as quiet as it could be when the power to it is pulsed though. 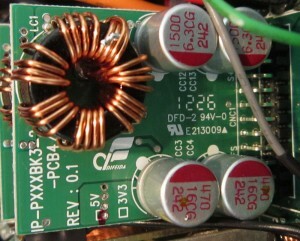 The PSU platform is somewhat similar to the In Win Green Me I reviewed some time ago, though the PCB UL number (e213009) is different. 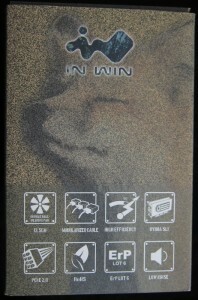 This suggests that the rumors are true and In Win does much of their own design work. That UL number has been seen in relation to both Enhance and Etasis, so it’s difficult to say what the full history behind this unit is. 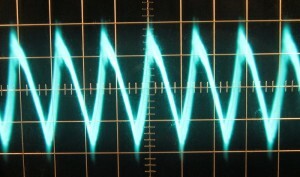 The transient filter has four Y caps, two X caps, a fuse and a MOV. The MOV is a TVR14471. 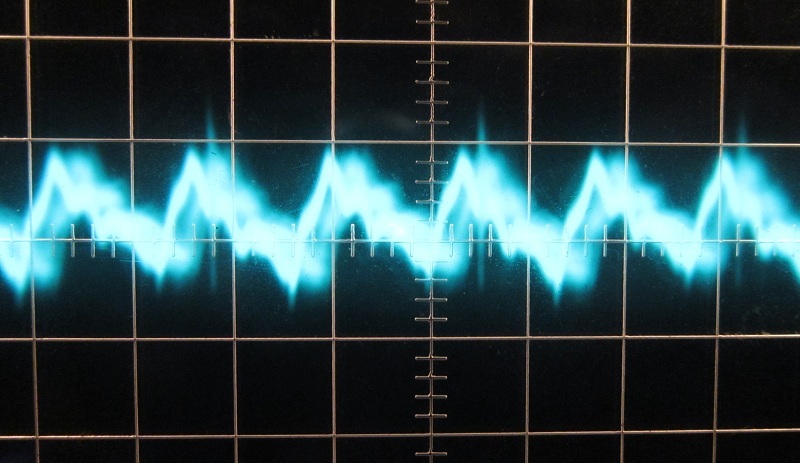 I’d prefer a TVS diode, but a MOV is far better than nothing. 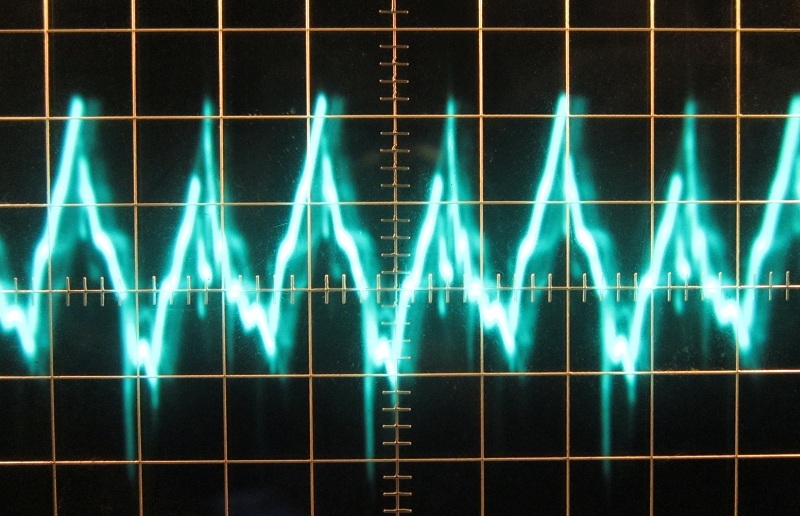 It’s a nice complete transient filter. 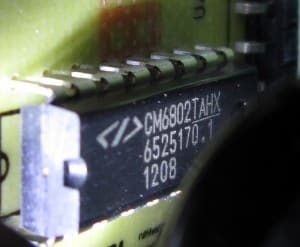 Controlling the operation we have a CM6802TAHX, it runs the Primary MOSFETs too. The APFC and the Primary side each get a pair of 26N60N MOSFETs rated at 19 A@25°c, 12 A@100°c, 600 V. The boost diode is a classic BYC10600 (10 A, 600 V) part. Both APFC caps are Panasonic in origin, definitely Japanese. 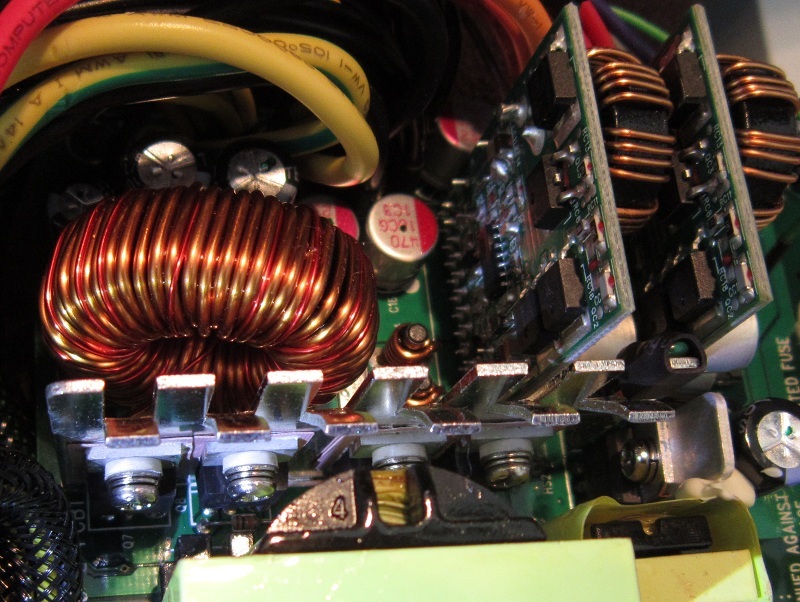 The 12 V is rectified by four 032N06N (120 A, 60 V) MOSFETs, 5 V and 3.3 V each get two 85N3L (80 A, 30 V) MOSFETs and two 60N3L (48 A, 30 V) MOSFETs. 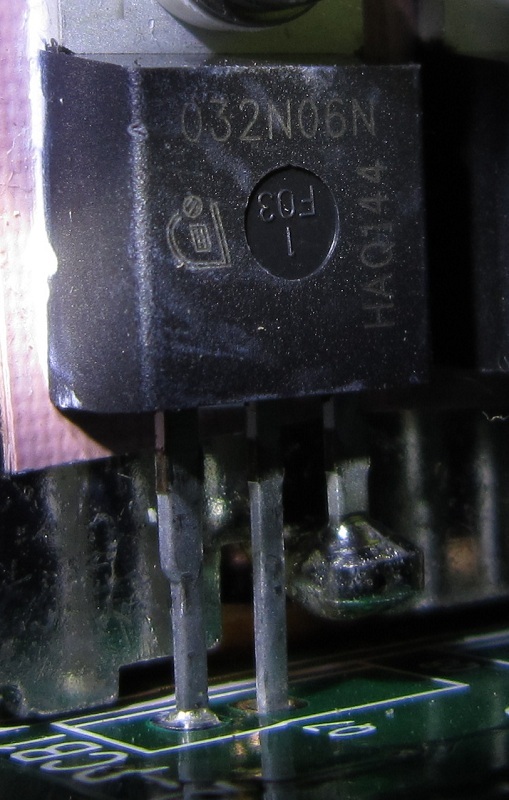 Secondary caps involve electrolytics from Teapo rated at 105 °C and some polymers from someone, not sure who. Nothing really spectacular to see here, nothing super good, nothing bad, it’s a functional PSU! 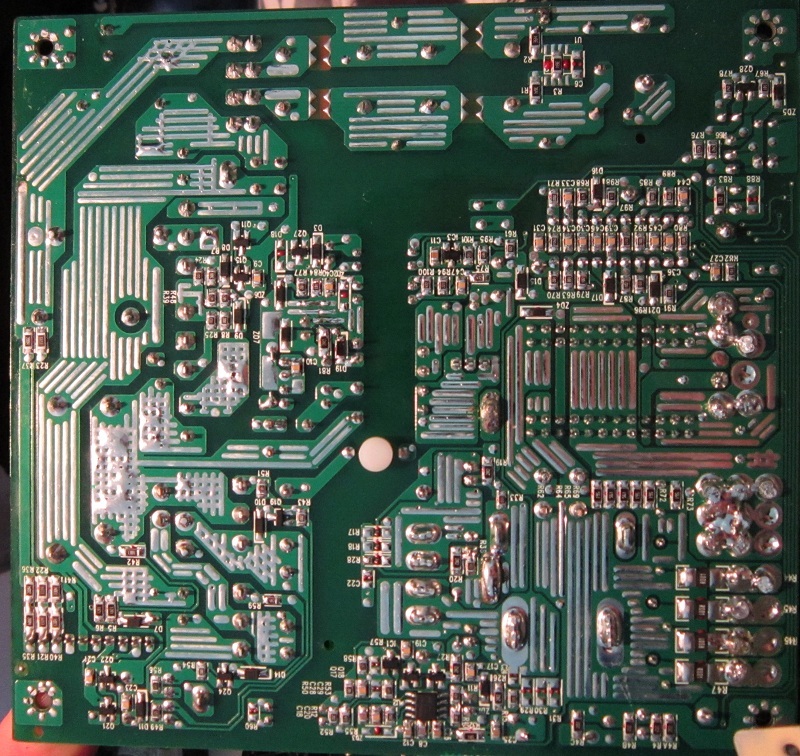 The soldering is very good, possibly excellent really. No issues worth discussing. 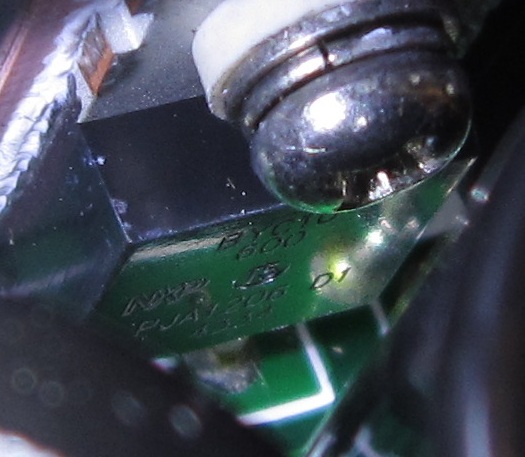 The modular PCB soldering is excellent, holding the standoffs on are very well soldered nuts. I approve. In Win has a pretty solid unit here. 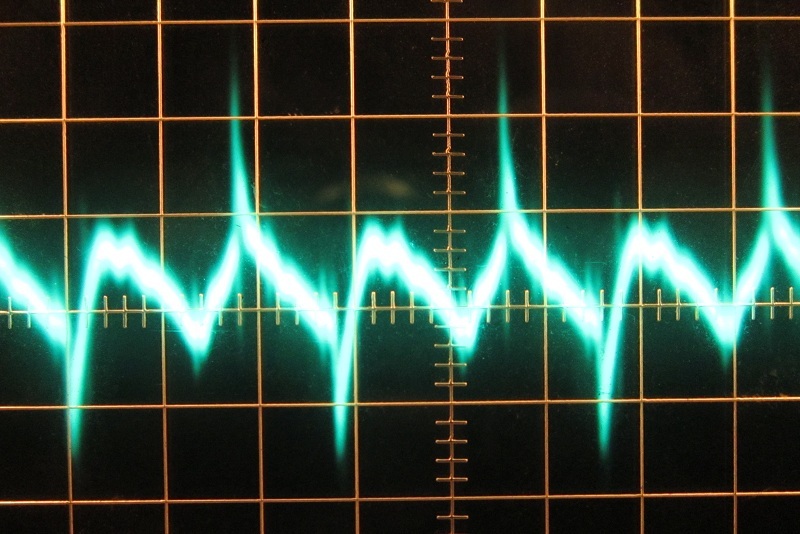 Performance and build wise nothing really stands out, which is fine when you get down to it. What does stand out is the styling and name! It’s, well, hideous, but in a unique and military way. I like it when you get right down to it. I find the naming surprising more than anything else, it prompted some historical investigation on my part and I rather hope it will on yours also. History is interesting! Much of it anyway, I can’t say I find American history riveting. Rather than get sidetracked, let’s step through the unit and blather about it for a while! The looks are fairly unique. I like them, but don’t expect this unit to blend into much of anything other than desert sands or a military themed case. 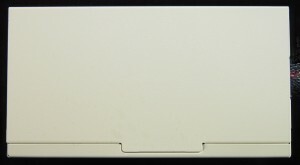 Maybe one with lots of Noctua fans. The performance is solid. 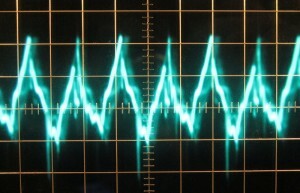 Regulation is very good, while ripple control is acceptable to decent. 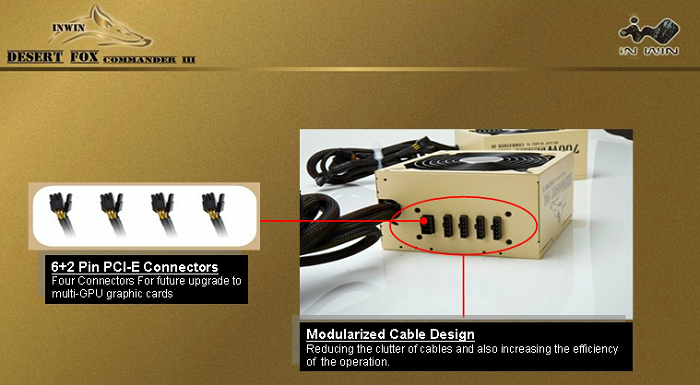 The cable selection is average for a 700 W unit, though I’d like a couple more Molex plugs personally. Most people don’t use many these days, but there are exceptions and I’m one of ’em. 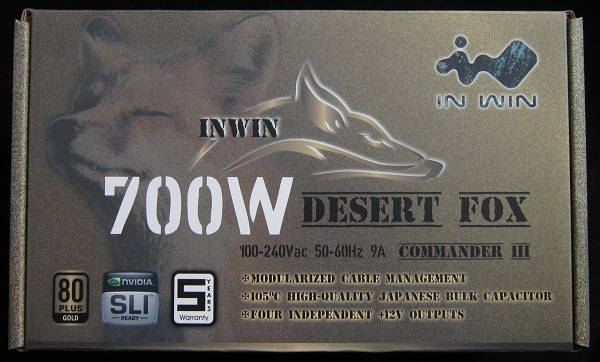 At an MSRP of $130 the price is a touch high compared to other 650-750 W 80+ gold units, though only a couple other units have four 12 V rails, many have fewer SATA connectors, and most have been discounted at least once. For a true value comparison we’ll have to wait until this unit is available at retail stores. As it stands, it’s a decent value, certainly not a bad value, but not a drool worthy value either. 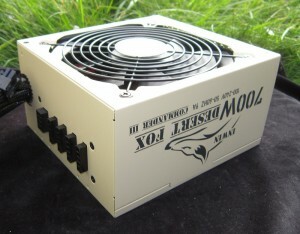 Unless of course you specifically need a military themed PSU, in which case it’s this one or forget it! Build quality is good, I didn’t find any issues. 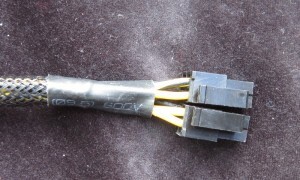 The sleeving on the ATX24P cable may be intentional so you have enough slack to get the connector apart for old motherboards. Internal build quality is great. 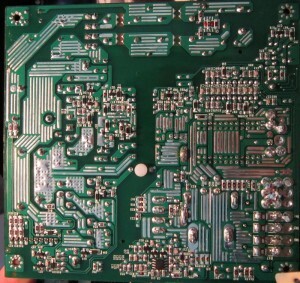 The soldering is excellent, and the design is solid too. The box is quite honest about things, which I appreciate. It really can do 700 W at 50 °C, without any real complaints. 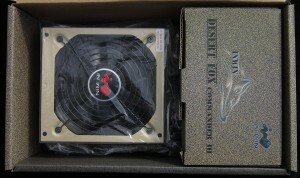 The fan moves a lot of air for a given amount of noise, but isn’t overly quiet. I’ll slap a Slightly Above Average Quietness rating on it. Very honest box / marketing. 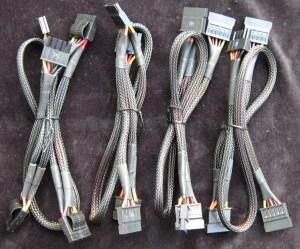 More SATA cables than many. ATX24P cable sleeving a bit short. Not much of a con list, some very nice pros, this unit easily acquires an Approved badge. 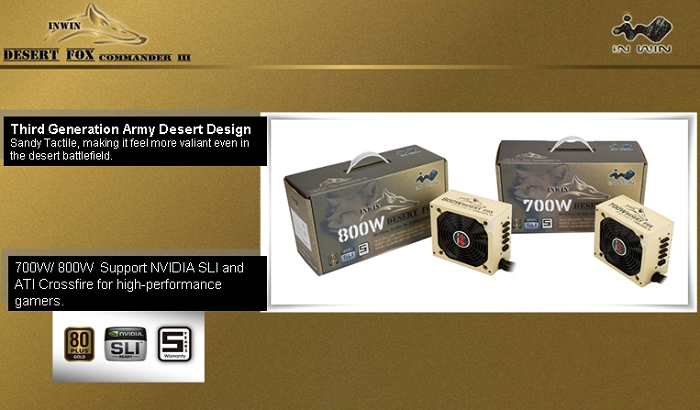 If you’re after a military themed PSU look no further. 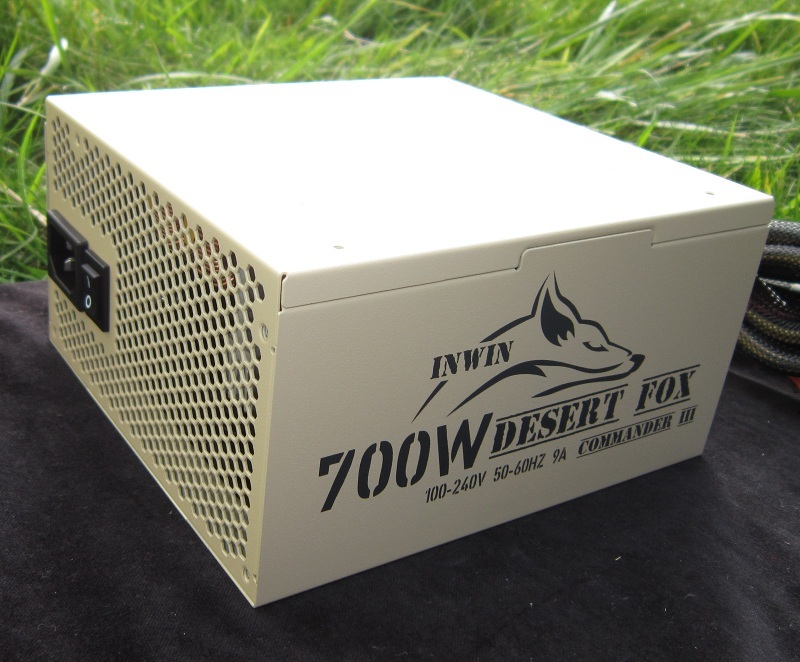 If you’re not, this In Win Commander III Desert Fox 700 W power supply is still a very solid choice. How many PSUs have you reviewed Ed? Something like that. I haven't counted recently. For budget builds, at least for me, there's Corsair CX series, and Corsair CX series only. Expect it within a few weeks, there are a couple other reviews yo do first. I didn't either until they sent me some. On average they're pretty good units too. Disassembling this one was kind of a pain, but that's my problem as a reviewer not yours as a consumer. Do you know who actually made this PSU? Obviously its Branded as InWin, but I don't think they are the one who made this. Nope, that I don't. 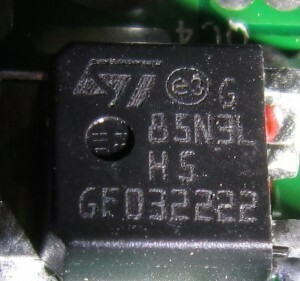 The UL number has been seen encountered on Enhance and Etasis units, but that just means that they used the same PCB fab plant. Given that Enhance and Etasis are both OEMs I expect that the PCB was made at a dedicated PCB plant. 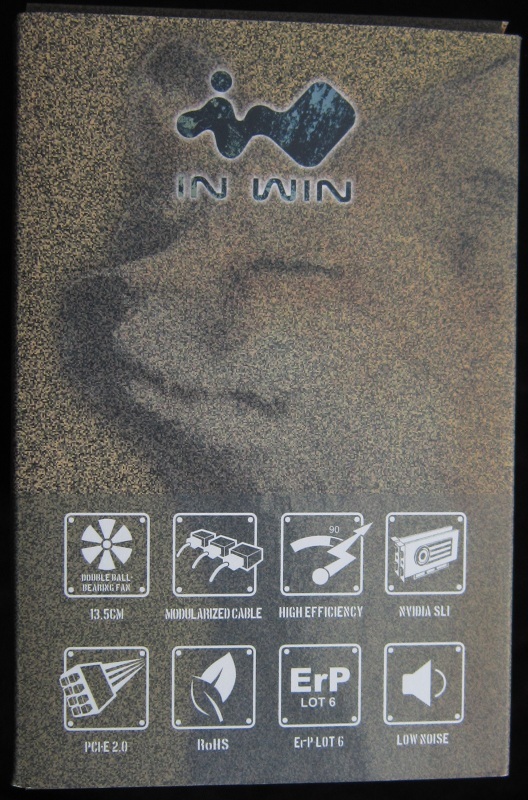 InWin may do it themselves, I've heard rumors that they do, but nothing concrete. 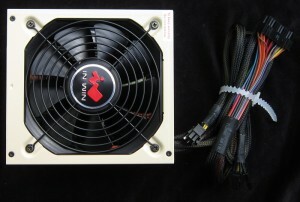 Thanks for interested and review our In-Win PSU. 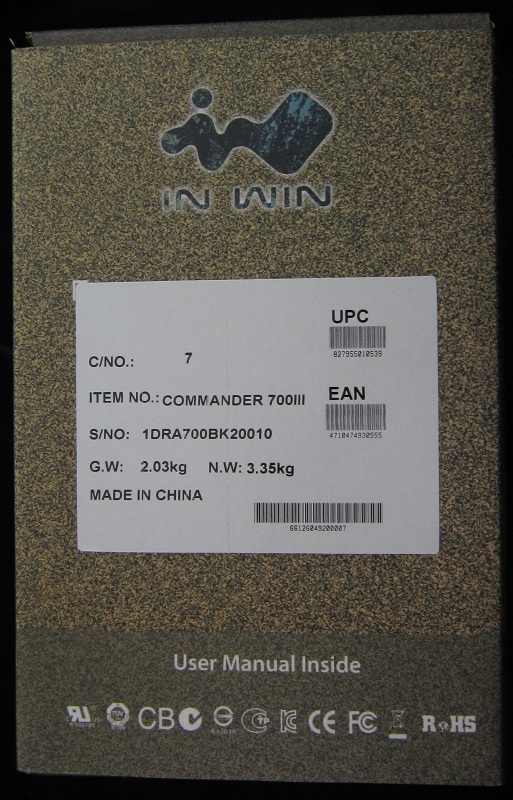 In-Win has our own factory to manufacture computer chassis and PSU. 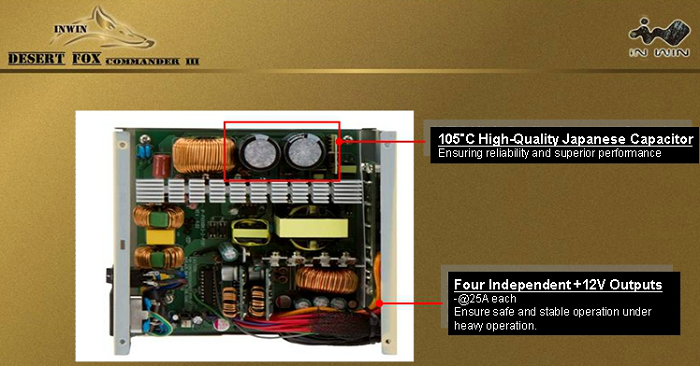 This PSU is designed in-house by our TW team and manufactured form our China Factory. 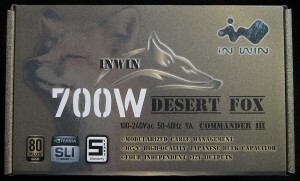 In-Win has already manufactured our own PSU for a long time. 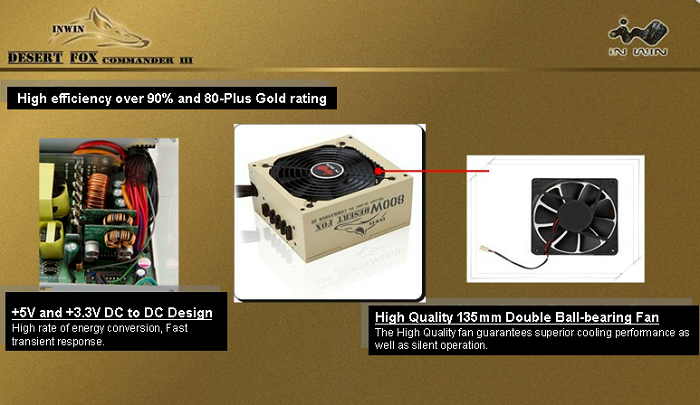 GreenMe and PowerMan series are manufactured by In-Win also. I enjoyed that review thanks. That unit has some really steady voltages. 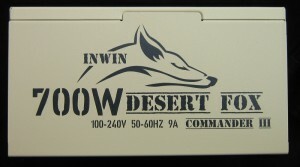 I like thed branding Desert Fox theme and mini history lesson. Funnily enough I just happened to watch a historical documentary that touched on the aspects you mentioned only last month!